The Breeders’ Cup Dirt Mile was launched in 2007. It’s a 1-mile race (1.6 km) run on a dirty racecourse. This race contrasts with the similar Turf race, run on grass. Since its inauguration, the Dirt Mile horse race has been taking place in the United States of America. In terms of functionality and breeding, the 1-mile distance provides a true indication of horses’ ability and speed. With the middle distance horses and sprinters meeting for the 1-mile race, USA fans and horse betting players enjoy this challenge and show. In 2016, they were giving away USD$1 million to the winner, and since then, Dirt Mile has grown to be one of the Breeders’ Cup Championship’s most anticipated events in the realm of sports betting in America. Read on below and find out more about Dirt Mile odds in the USA. With a race such as the Breeders’ Cup with so much value, the chance to bet on the Dirt Mile race at trusted online sportsbooks makes the experience twice as nice. In the current competitive betting industry, USA players can take advantage of the fantastic lucrative bonuses, rebates and loyalty programs, making it easy to stay profitable. Though nothing beats going to the actual race course on the big day, online sportsbooks offer financial incentives and convenience that the race course doesn’t. 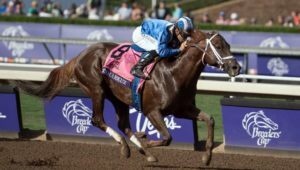 With a wide range of bets available, Dirt Mile Breeders’ Cup can offer a great opportunity to play superfecta, multirace or exacta wagers like the Pick 3. The dirt mile race has been occasionally part of the Pick 4 sequence, but it varies year on year. Of late, the Breeders’ Cup Dirt Mile has been part of the Friday card for the Breeders’ Cup Championship. Betting on the Dirt Mile race in America is one exciting thing to do. The atmosphere at the race course is incredible, and so is betting online in the comfort of your home. With exclusive bonuses and promotions, register at any of the best racebooks we feature on our site and start betting on the Breeders’ Cup in America.